Gil is a complex crustacean. Take five and go behind the shell with this video account of Gil’s journey. We took a character from a commercial, turned him into a character on the internet, with frustrations, hopes, ambitions and a sense of humor. He blogged, commented and responded to every message and post. In fact, he used Myspace just like a person would. He also had a story to tell. To learn about the story – and its success – read on. It began in an integrated concept session in a second-floor RPA conference room. 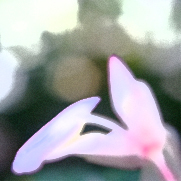 But unlike other “different” ideas that die in a room, this one lived. Because it had legs. Eight of them, actually. As with any sea-level actor, he found ways to self-promote. RPA wanted buzz, hype, mania and…animated pinches. So Gil started his own Myspace page, showcasing witty music preferences, glam Gil photos and an amusingly addicting blog. He even answered all his fan mail: engaging, entertaining, chatting and…big pinching. Unfortunately, Gils lost his job. Just as Gil worries that he can only ride the “I pinch” wave so far, Gil loses his acting contract with Honda. Refusing to resign himself to a life of selling his moltings on EBay, Gil starts a petition on savethecrab.com, as well as his own theme song (featured in video above). Gil gets “pinched” by the Manhattan Beach Police. 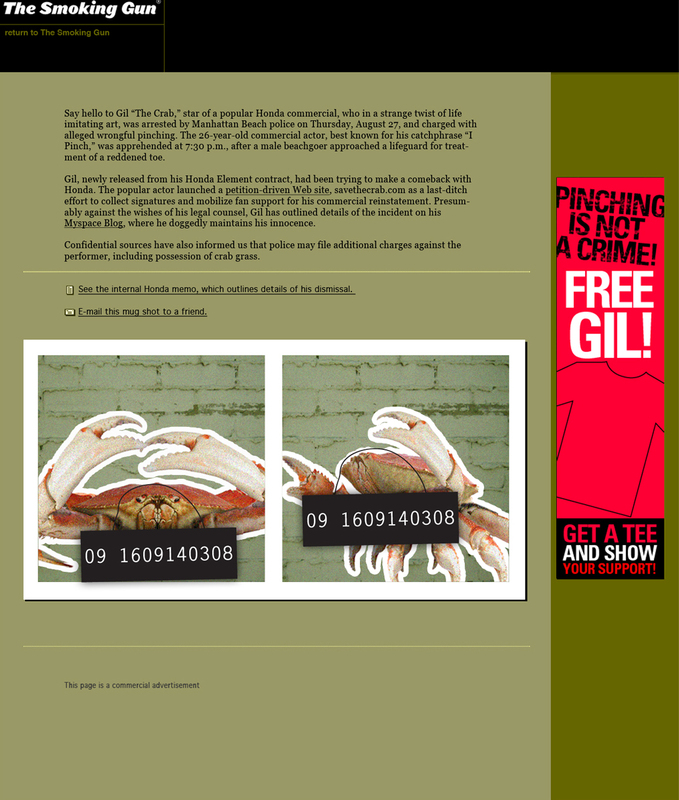 A suspiciously framed pinching incident – showcased with Gil’s unfortunate mug shot on thesmokinggun.com – brought another setback to the devastated and unemployed crab. Crustaceans have tough shells, but are they tough enough to handle this luck? Gils gets his job back, and writes and directs the new spot. 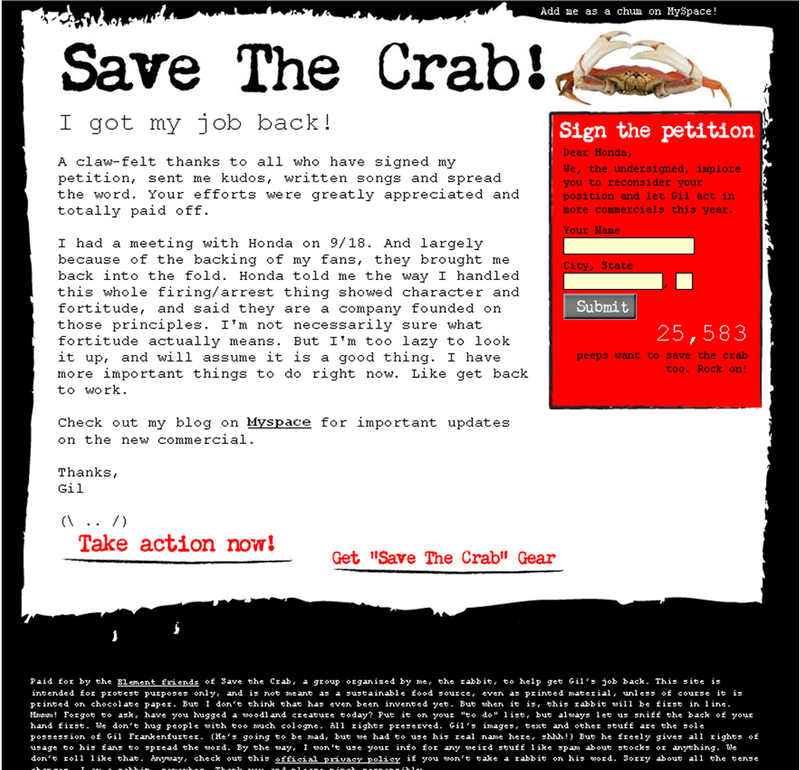 With 25,000 signatures on savethecrab.com, Gil not only gets his job back, but gets to write, cast and direct his next spot, greeted by two claws up. He’s also cleared on the pinching charges. The real success was proving to our Honda clients that we could do social media in a way befitting to the medium – engaging, social, and interesting, which ended up winning us a Yahoo! Big Idea Award and also becoming an Official Webby Honoree Award. The Team: J Barbush, Luis Ramirez, Adam Lowry, Ariel Shukert and Lauren Smith.